To finish off this “Beauty Week,” I thought I’d talk a little bit about my updated hair care routine. Last time I talked hair, I was telling you all about the pretty major haircut I got after my wedding. Well, of course, since then, my hair care routine has changed a bit. I no longer need to worry quite so much about hydrating my ends, as they are younger and have loss less moisture. But I still keep to heart the lessons I’ve learned caring for long hair. I still use my hair multi-masking technique on Sundays to both clarify my scalp and moisturize my length at one time. This still helps me lose fewer strands when I rinse because I can rinse once. 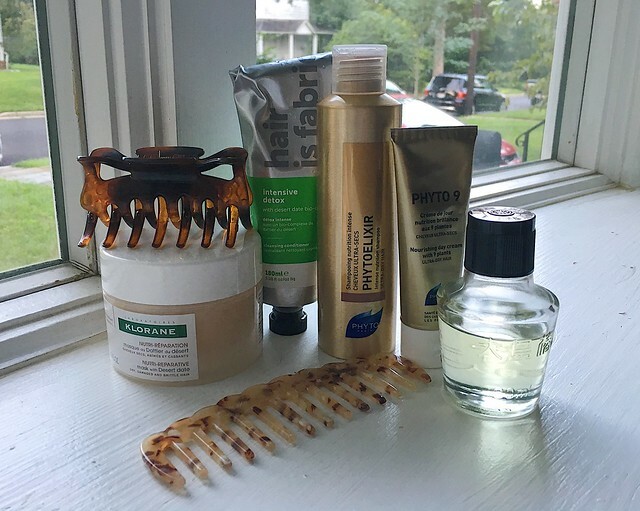 Despite having a rather lukewarm first impression of it, the Deciem Hair is Fabric Intensive Detox is my scalp mask of choice for this, with my favorite Klorane Mask with Desert Date on my length. Because my hair is no longer long enough to be held with my acrylic hair fork, I use a claw clip to twist it up and out of my way while the two masks work, and do other shower things (like shave my legs). The rest of the week, I actually don’t condition my hair. I wash my hair twice besides my weekly deep treatment. Lately, I’ve been using the Phytoelixir Intensive Nutrition Shampoo for my mid-week washes. It’s cleansing enough to keep my scalp happy, but it has a bit of conditioning action so my hair doesn’t get tangly. That said, while I love the scent and it makes me feel fancy, I’m not sold on it as a go-to, so I would be open to further suggestions of gentle, rich shampoos. Of course, since I don’t use conditioner in the shower, I still rely on my leave-in treatments. For my shorter hair, I have to be judicious with my use of oil, since I don’t have a huge amount of distance between my ends and my scalp anymore (although most people would still call my hair “long”). But I do apply the occasional drop or two of Oshima Tsubaki oil. I also like to use this as a pre-shampoo treatment. But for daily use, I like my Phyto 9 Day Cream. It’s a lightweight, and yet still conditioning, cream that I can apply about a lentil-to-pea-sized dab to my damp length and it dries silky and shiny. NB: I purchased all the products mentioned with my own money and have received no incentive to review them. All opinions are my own. All links are non-affiliate.